This is a revised and updated edition of the highly successful first edition. 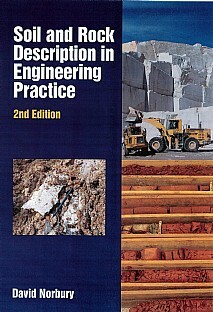 In the intervening period the procedures used in the description of soils and rocks have continued to develop and evolve and this new edition incorporates changes in the national and international standards, BS 5930:2015 and EN ISO 14688 and 14689 and makes close comparison with US practice in description (ASTM D2488) and classification (ASTM D2487). In addition, changes in definitions, naming procedures, and new terms are all included and explained. More detailed guidance is given for several procedures including identification of minerals in the process of naming rocks, comparisons of terminology between engineering geology and the other geosciences and alignment of the classification approach to that proposed for earthworks in line with EN 16907. The book continues to provide invaluable practical guidance in carrying out engineering geological logging of soil and rock samples and exposures in the field. The systematic and codified approach are laid out in detail to ensure the defined descriptors are used in a consistent format, rendering mistakes less likely and the necessary communication from field to design more successful. The procedures, techniques and tips within this book continue to serve and guide young practitioners learning their craft, but also their seniors and mentors, including responsible experts who sign off the logs and report on behalf of their company. More than ever the need to be aware of current practices in order to avoid costly mistakes is paramount. Will continue to be of immense value to geologists, engineering geologists, geotechnical/ground engineers or anyone involved with ground investigations, from commissioning to interpretation.